570 students from schools for the disabled (SLB) and mentally disabled parlors, as well as deaf homes under Jakarta Social Dept. are participating the counseling and dental examination at Block G Hall of Jakarta City Hall, Sunday (7/29).
" With healthy teeth, they can consume nutritious and healthy foods"
The activity held by Social Dept. 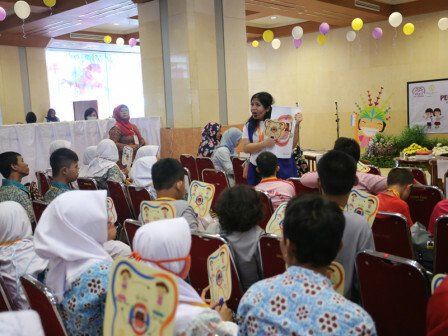 along with Indonesian Dentist Association (IDGI) and Department of Children's Dentistry, University of Indonesia, to commemorate National Children Day (HAN) that falls on July 23. Organizing Committee Chairman, Andria Diarti stated it aims to improve health and prevent tooth decay easily. "We ask them how to do the toothbrush together. And there is also counseling about the importance of tooth brushing and dental examination," he told. Besides being equipped with dental hygiene materials, those participants are also given an understanding of healthy foods to grow their teeth. By so, children with special needs are hoped to have healthy teeth. "With healthy teeth, they can consume nutritious and healthy foods. Our target is to support Indonesia free caries by 2030," he said.